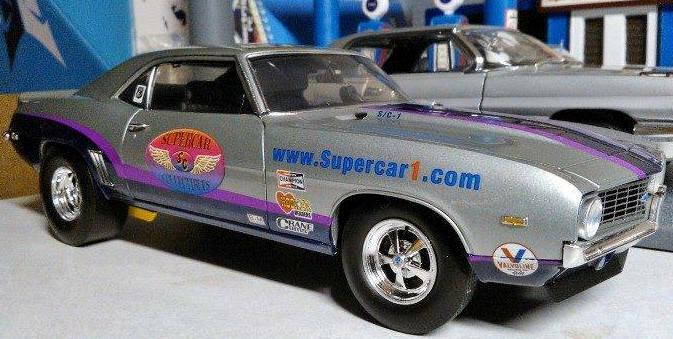 Home :: Past/Present/Future (LONG List) :: 1969 Camaro "Supercar1.com Drag Car" (402 made) Few Left! #50697 (READ ALL - as $11.95 OFF shipping cost on this car) This special Supercar1.com car in Bright Silver Metallic, has Magenta & Deep Violet graphics, the Supercar logo on the doors, and S/C-1 lettered on the cowl hood. Open the hood to see a nicely detailed 427 cubic inch rat motor with plug wires, fuel line, battery cables, white 4 tube headers, plus correct style hinges on the opening doors - with the door glass in the up position. Also a wired & readable dash mounted tach, a carpeted no console black bucket seat interior, cloth seat belts, and a 4 speed. Underneath see the working suspension, real metal emergency brake cables, rotating driveshaft, driveshaft loop, and a pair of traction bars with snubbers to hold the 12 bolt rear in place. All this rides on chrome Cragar S/S mags, with some deep dish in the rear, and good sized slicks. 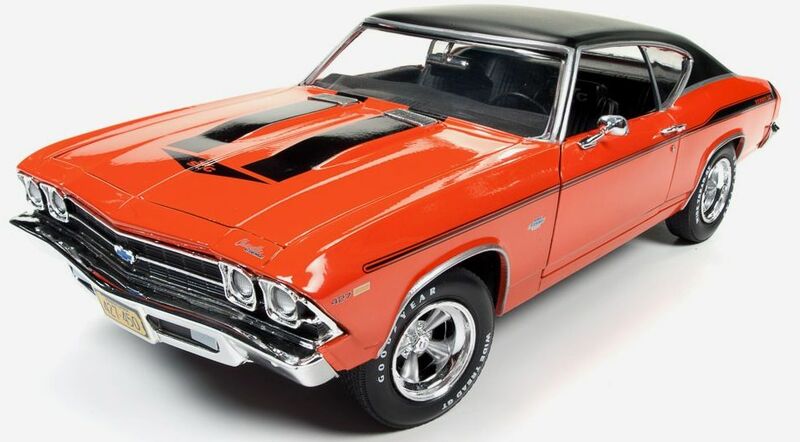 Produced by Die Cast Promotions as a Limited Edition of 402 cars made especially for Supercar Collectibles. These are here in stock now, ready to ship to you. NOTE: The $3 handling/packing fee does apply, BUT you do get FREE shipping to USA48, or $11.95 OFF shipping anywhere else. Want one?